This sign placed at the edge of your yard will act as a caution sign and remind motorists to slow down. Patterns drawn FULL SIZE. 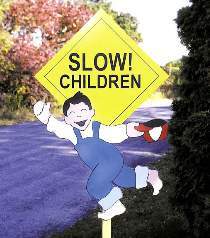 Order 8556 Slow Children decal separately or see Special Offer. Measures 40"H x 26"W, not counting the post.